When you are planning to paint the garage door, the most important thing is getting the best quality powder coat. 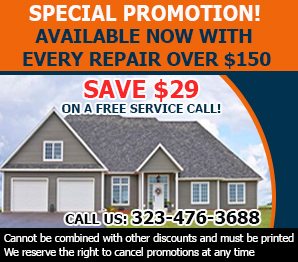 The experts of Garage Door Repair Huntington Park can help you choose the brand. Though, it's equally important to apply undercoats for resistance to elements on non-galvanized materials. How do I clean the tracks? Use a wet soft sponge to remove the dirt and residue from old lubricants. You need to clean them well enough so that you can see the metal surface again. Don't forget to lubricate the garage door parts afterwards and check whether they're dented. What components must I change during door replacement? When you replace the existing garage door, it's good to examine the condition of all components. If the new panel is heavier, focus on the strengths of the garage door springs, rollers and opener. Depending on the size/type of door and the choice of rollers you might have to replace he tracks, too.